MARCHING ON: Millions of women took part in the demonstrations in Spanish cities including Madrid, Barcelona, Malaga and Bilbao. 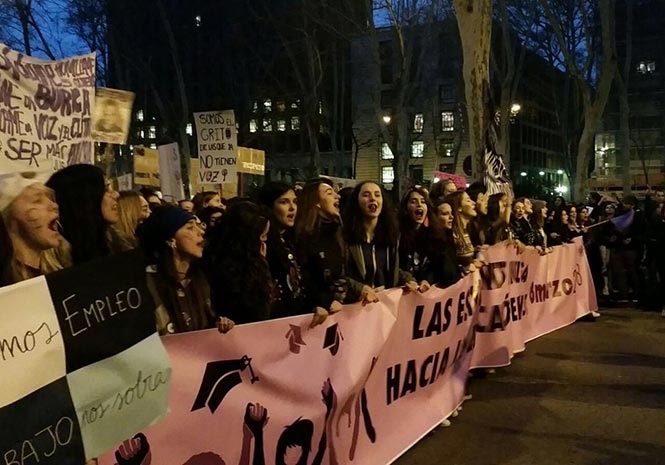 WOMEN from across Spain took the streets of cities up and down the country to take part in the first feminist strike to mark International Women’s Day. Around 5.3 million took part in the walkout, according to trade unions, which was called in protest over gender inequality, violence and wage gaps. The demonstrations had the backing of Manuela Carmena and Ada Colau, the mayors of Madrid and Barcelona respectively, as well as 10 Spanish trade unions and female politicians. “We do not accept worse working conditions or being paid less than man for the same work,” it stated. The strike was also supported internationally, with actor Penelope Cruz cancelling public events in solidarity with demonstrators. The ruling Partido Popular (PP) and the Partido Socialista (PSOE) opposition both issued manifestos to coincide with the day. The PP stressed measures they had taken while in government. These included the State Pact against Gender Violence, an increase in pensions for mothers with two or more children and plans to combat the trafficking of women. The PSOE said progress had been made on women’s rights in Spain but the female population still faced a number of obstacles to full equality. These included the reconciliation of work and family life, the elimination gender violence and achieving gender equality in politics and decision making roles. Women earn on average 13 and 19 per cent less than men in the public and private sectors respectively in Spain, according to data from the EU. Forty-nine women were killed by their partners or ex-partners in the country last year, an increase from 44 in 2016. The latest Spanish government data on gender violence and abuse stated that almost 142,900 cases were reported in 2016 compared with more than 129,190 in the year before.